Welcome to the Aquarium Power Strips & Timers superstore! Keeping your aquarium setup on a regular schedule is essential to preserving the health of your water and natural behaviors of your fish. At petmountain.com, our selection of programmable timers and power strips makes it easy for you to automate your fish tank's pump, lighting fixture, wave maker, and more. We want to make maintaining a healthy, beautiful aquarium as easy as possible, and right here is where you'll find the tools to make it happen! 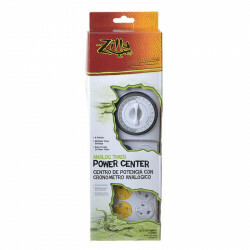 Pet Mountain's Aquarium Power Strips & Timers store features top quality products from the most trusted names in aquarium care and maintenance equipment, including Zoo Med Aquatic, Coralife, Rio, and Aquarium Systems. Our low price leader, the Zoo Med AquaSun Aquarium Controller Timer & Power Strip is a programmable timer and power strip in one. The AquaSun Controller includes 8 grounded outlets with an easy to program analog design. 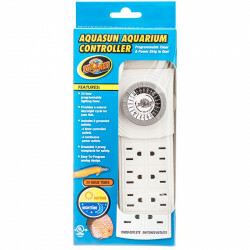 With 4 timed outlets and 4 switched outlets, Zoo Med's AquaSun Aquarium Controller Timer & Power Strip is perfect for providing your aquarium and fish with a natural day/night cycle. If you're looking for a great deal, our Coralife Power Center Day-Night Timer or Wave-Maker Timer can be used for aquariums for light fixtures or powerhead water pumps to control on / off times periodically through the day. The Coralife timer can also be used for reptile terrariums or any pet that requires lighting timers! Built with safety in mind this Power Center Timer has sliding outlet safety covers on each of the 8 outlets, 15 amp 120 volt (1875 watts max.) circuit breaker and is UL listed. 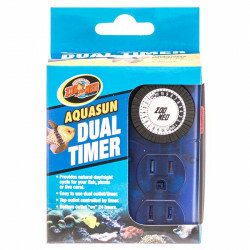 Our discount Zoo Med Aquatic Aquasun Day / Night Timer has two 3 prong outlets and is safe for Freshwater or Saltwater aquariums. It provides natural day/night cycle for your fish, plants or live coral.